Bellator To Hold Eight-Man World Grand Prix Heavyweight Tournament In 2018 » MMA H.E.A.T. 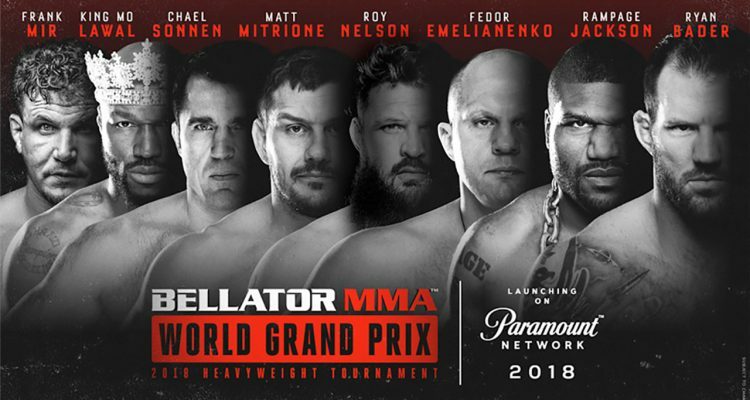 LOS ANGELES – Bellator has announced plans to host a year-long grand prix heavyweight tournament in 2018 featuring eight of the roster’s biggest stars with the winner becoming the new Bellator world heavyweight champion. The Bellator MMA World Grand Prix 2018 Heavyweight Tournament will air on the soon-to-launch Paramount Network. The star-studded list of participants includes newly signed Quinton “Rampage” Jackson (37-12), Roy Nelson (23-14), Chael Sonnen (30-15-1), Frank Mir (18-11), “King Mo” (21-6, 1 NC), Fedor Emelianenko (36-5, 1 NC), Matt Mitrione (12-5) and Bellator light heavyweight champion Ryan Bader (24-5). Spanning multiple events and locations throughout 2018, the three-round tournament allows for matchups never before thought possible and will ultimately crown a new Bellator heavyweight champion. Previously, Bellator President Scott Coker orchestrated the most recent successful heavyweight tournament in mixed martial arts with the STRIKEFORCE Heavyweight Grand Prix that spanned from 2011-12. Matchups, dates and locations for the single-elimination grand prix will be determined shortly, as will tournament alternates who will be available to fill in due to any unforeseen circumstances. A five-fight veteran of Bellator MMA, “Rampage’s” legendary career has seen him compete against some of the top names in the sport, generating a loyal army of fans along the way. The former PRIDE and UFC champion is the proud owner of many epic highlight reel slams and knockouts that he has racked up throughout his epic battles with the likes of Chuck Liddell, Dan Henderson, “King Mo,” Kevin Randleman and, perhaps most-notably, his trilogy with fellow Bellator athlete Wanderlei Silva. Fighting out of Las Vegas, Roy Nelson made his Bellator debut earlier this year with a hard-fought victory over Javy Ayala following an eight-year, 19-fight run with UFC that saw him earn wins over Mirko Cro Cop, Antonio Rodrigo Nogueira, “Bigfoot” Silva and Cheick Kongo. “Big Country” also memorably defeated the late Kimbo Slice and later went on to win season 10 of The Ultimate Fighter. With 19 of his 22 career wins coming by way of knockout or submission, the long-time fan-favorite looks to add a championship to his impressive resume. Chael Sonnen spent a majority of his 44-fight career with the UFC and WEC, a run that saw him defeat former middleweight champion Michael Bisping, and compete against the likes of Jon Jones, Anderson Silva (twice), Rashad Evans, “Shogun” Rua, Demian Maia and Brian Stann. In addition to his in-ring action, the West Linn, Ore. native has mastered the art of being in front of the camera, having done broadcast work for both ESPN and Fox Sports. Following a three-year hiatus from active MMA competition, Sonnen returned to the cage against Tito Ortiz at Bellator 170 in January and then went on to defeat Wanderlei Silva in the main event of Bellator: NYC. Frank Mir joined Bellator earlier this year following 15 years under in the UFC where he became a two-time world champion, collected 16 victories and defeated the who’s who of heavyweight contenders, including Brock Lesnar, “Bigfoot” Silva, Antonio Rodrigo Nogueira and Roy Nelson. Fighting out of Las Vegas, Mir set numerous records while competing with his former promotion, highlighted by the most fights (27), victories (16), and submissions (8) in heavyweight history. With 14 of his 18 career wins coming by way of knockout or submission, the Brazilian Jiu-Jitsu Black Belt will now try his hand in Bellator’s heavyweight division. “King Mo” will again fight at heavyweight and look to build off his success within the division following recent wins against Satoshi Ishii and Cheick Kongo. A winner in nine out of his last 11 fights, the 36-year-old will look to claim heavyweight gold in 2018 and add to his championship collection that already includes a STRIKEFORCE light heavyweight title. The “Moneyweight” fighter owns additional wins over Linton Vassell, Gegard Mousasi, Roger Gracie and has split a pair of bouts with “Rampage” Jackson with their series tied at one win each. A former PRIDE champion, “The Last Emperor” is one of the most revered and respected heavyweight fighters the sport has seen. Stone-faced and quiet, Emelianenko boasted one of the most impressive unbeaten streaks in the history of MMA, not losing a bout between 2001 and 2009. A multi-time world champion in MMA and Sambo, Fedor recently returned to the sport after a brief hiatus, accumulating two decisive wins since his return to action and competing against Matt Mitrione in an instant classic at Bellator: NYC. Matt Mitrione remains poised to make an impact in the Bellator heavyweight division following three knockout wins since signing with Bellator in 2016, including a first-round KO of Fedor Emelianenko at Bellator NYC this June. The Illinois native and standout defensive end at Purdue University earned All-Big Ten honors in 2000 and subsequently earned his way into the NFL where he played six seasons as a member of the New York Giants and Minnesota Vikings. Mitrione ultimately found his way into MMA where he became a high-level competitor, defeating the likes of the late Kimbo Slice, Derrick Lewis and Gabriel Gonzaga. Bader will make his third appearance for Bellator and first since defending his light heavyweight championship at Bellator 186. Fighting out of Tempe, Ariz., Bader began his professional career on an impressive run, steamrolling the competition en route to a 12-fight winning streak and winning one of the most competitive seasons of The Ultimate Fighter in franchise history on Spike in 2008. “Darth” continued his path of dominance by collecting 15 over some of the 105-pound division’s top talent, including victories over former world champions Antonio Rogerio Nogueira, Rashad Evans, as well as two wins over Phil Davis. Currently riding a four-fight winning streak with victories in nine of his past ten bouts, the former two-time NCAA Division I All-American wrestler from Arizona State University will look to become a current two-division champion in Bellator MMA. No Comments on "Bellator To Hold Eight-Man World Grand Prix Heavyweight Tournament In 2018"